About 2 years ago, I reviewed Mirror’s Edge as an excellent and refreshing game. Recently I stumbled upon this interview with one of the artists which made me replay the game, on hard this time. Hard in Mirror’s Edge means: no runner’s vision (highlighting objects in red that you can use in your parkour) and of course more vulnerable to damage. Once you know how to move about in ME’s world, you don’t miss the vision. Of course you have to be quick to scan the environment for possible exits while keeping momentum, but it’s fairly easy. Being more vulnerable is in general also no problem since you’re not supposed to be hit anyway. 🙂 If you take a hit, you’re slowing down hence taking a second hit which most likely kills you. So it wasn’t until the final chapter that I got stuck because I couldn’t disarm a heavy guard. Kicking was no solution since there were other guards around but no light guards to pick their gun. Watching a walkthrough vid, I was reminded of the “bullet time” feature (called reaction time in ME). I never used that as I thought it was only meant for cheaters. 😉 Turns out it’s about the only way to take out the heavy guards when there’s more than one of them. Another thing I learned is that you need to dodge-jump when fighting runner-like enemies. I had more fun than the first time I played it since I quickly remastered the movement combo’s which allowed me to play in a more relaxed way but also in the way it’s meant to played. You know, without being killed all the time or falling off a building. 🙂 It took me about 7 hours, which is slightly more than the first time (which I played on normal). Made some steam screenshots on the way. When it’s hot, try a refreshing lemon drink. The cake is a lie. Or not?! I can’t believe I wasn’t aware of this Portal easter egg up until now! I remember staring at those screens for a few seconds, but didn’t see the ‘recipe’! 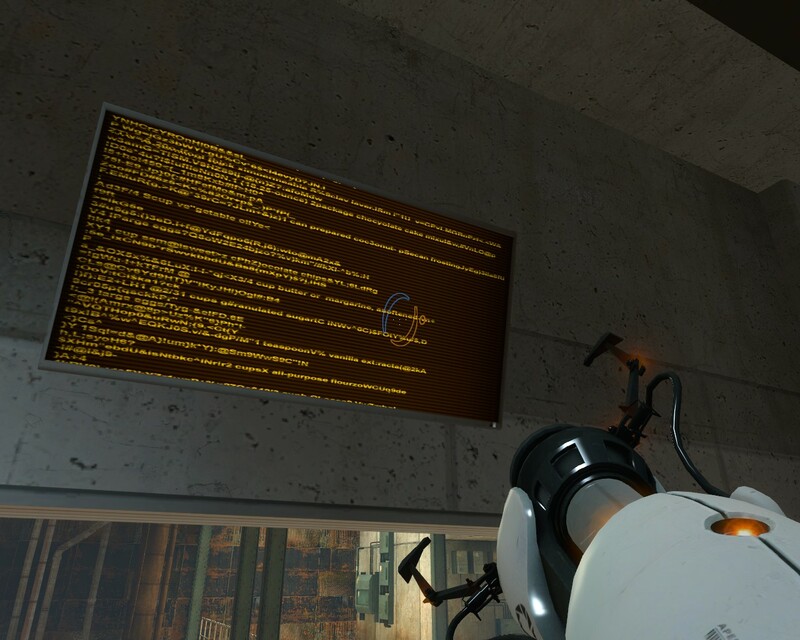 Note to self for Portal 2: analyse each byte you encounter. If you own a dual action gamepad, i.e. one with 2 sticks, Gunroar is a game you MUST try out. If you don’t own that, you might wanna try it out anyway as there are also game modes that are well playable without a gamepad. Normal mode: one stick to navigate. If you start to shoot, the navigation stick becomes a strafing stick. Also “torpedos” available. Twin stick mode: real dual action 🙂 Use one stick to navigate, the other to aim/shoot. mouse mode: use arrows for navigation and pointer to aim and fire. Don’t think this mode would be inferior because of the focus on gamepads in the other modes! written by some Japanese guy Kenta Cho.